Many of the techniques for creating and editing text in Adobe PageMaker are similar to those of Microsoft Word. 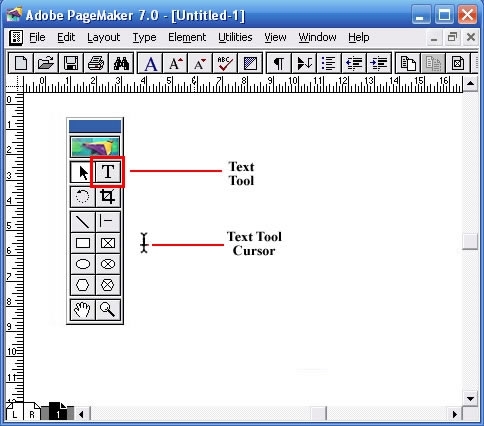 The main differences are that in PageMaker, you will use the Text tool, and all of your text will be typed into a text box or text frame. Read on to learn how to work with text in this DTP application. Select the "Text" tool from the Toolbox. Move the cursor back to your document, where it will turn into an I-Beam (see diagram). Click the mouse at the spot in your document where you want to type in your text. Drag your mouse to create a rectangular box. Release the mouse once the text box is of the size you want. Your cursor will automatically position itself inside the box, in the upper left-hand corner. Begin to type in your text. The text may be of a very small font; you can increase the font size by clicking on the "View" menu and then clicking on "Zoom In" from the pull-down menu. Select the "Text" tool from the Toolbox. 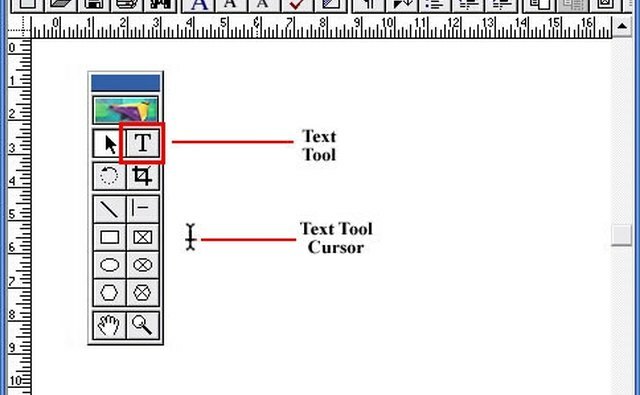 Click your cursor at the beginning of text that you want to edit or format. Highlight text by dragging the cursor across all the text you want to work on. Delete text using one of the of these methods:-Press down your "Delete" key -Begin typing to replace the highlighted text-Click the "Edit" menu and select "Clear" from the pull-down menuCopy or move the text using one of the of these methods:-Press "Ctrl + X" to cut text, or press the "Ctrl + X" keys to copy the text-Click your cursor at the spot where you want to copy or move your text-Press "Ctrl + V" keys to paste the text.Alternatively, click the "Edit" menu, then select the "Copy," "Cut" or "Paste" command as desired. Select the "Text" tool from the Toolbox. Drag nit across the text you want to work with to highlight it. Click the "Type" menu to open the drop-down menu, which will have a number of different menu options. Some of the options will have sub-menus, if they have an arrow to the right. Click on the particular type style that you want from the menu or sub-menus. A check mark will be placed next to the option that you have selected. The type style of the highlighted text will also change to reflect your choice.